The plugin allows adding breadcrumbs in the structure of different post types. Enabling breadcrumbs for a post will add its path along with taxonomies. Step 1: From the WordPress dashboard navigate to Settings > Schema Pro. 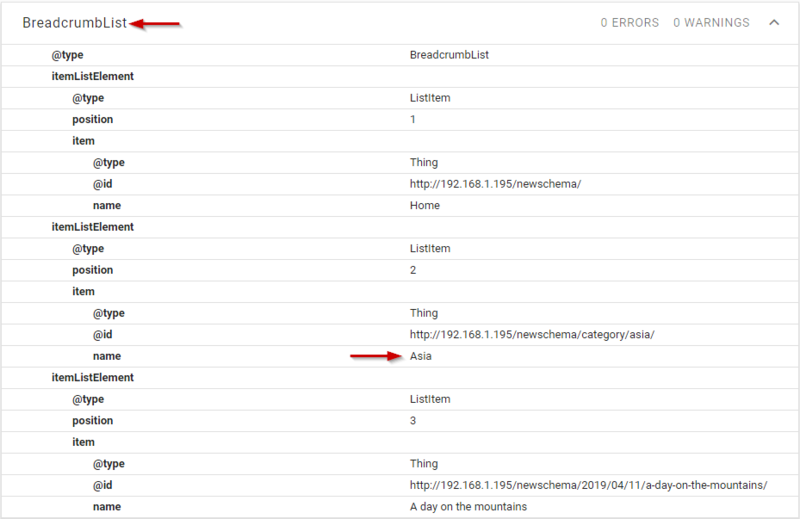 Step 2: Go to Configuration > Other Schemas > Enable Breadcrumb Schema and select the checkbox. A new tab for Breadcrumb will appear. Step 3: On the Breadcrumb tab, you will find additional settings to choose taxonomy for Posts. Note: If you have a WooCommerce plugin installed and activated, the Products option will be available. 1. Consider you have a blog with a title – A day on the mountains that is assigned to category Asia. 2. You have enabled Breadcrumbs with the above steps and choose the taxonomy – category for posts. 3. When you inspect a single post (with a title – A day on the mountains) in Google Structured Data Testing Tool, it shows an exact path for it. That means you can see a structure of a single post page on the site.